C2 Education (C2) the nation’s fastest growing network of subject tutoring, SAT ®, ACT® and PSAT® test prep and educational support centers has opened a new center in Maple Lawn - Fulton, Maryland. Maple Lawn families with children under the age of 18 now have their very own C2 tutoring center. The center is conveniently located at 8194 Westside Boulevard, with easy access to businesses, shopping, and restaurants. The Maple Lawn center offers customized tutoring services for kindergarten to high school aged students and specializes in SAT, ACT and PSAT test prep. The Center is already offering programs and curriculum for the new, harder SAT, replacing the current SAT in 2016. The new center occupies 1200 square feet and will employee 10 to 20 staff. C2 Maple Lawn can accommodate up to 250 students per week and serves all area public and private schools. C2 is known for establishing strong community bonds and the Maple Lawn Center will not be an exception. “We are excited and honored to become a part of this vibrant and prestigious community. Grace Park, Center Director looks forward to helping Maple Lawn students reach their academic potential.” Stated Regional VP, Navin Gurnaney. 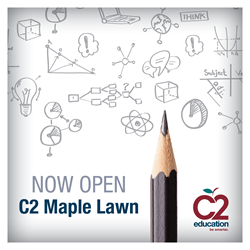 Visit the company’s website at http://www.c2educate.com for more information on how C2 may benefit your student and to sign up for a consultation at the new Maple Lawn location. C2 Education was founded in 1997 by David Kim and Jim Narangajavana, two Harvard students offering private tutoring programs from their dorm room. In 2000, C2 opened their first location in Maryland. As of 2014, the company has grown to over 150 centers nationwide, and will double the number of centers in the next three years. C2 serves over 12,000 students and their families each week. C2 is one of the premier SAT/ACT test prep and subject tutoring companies in the U.S., providing expertise with trained and often multilingual tutoring staff as well as customized curriculum. C2 was the first test prep provider to write and publish student workbooks for the new SAT.